Summer is in full swing and those hot and humid days are sure to lure you and your family to the pool, beach, or lake for some relief from the heat. With all of the fun and excitement, there's a pretty good chance your dog will want to join you for a refreshing swim to cool off. Most pet owners believe that all dogs are natural swimmers and while most breeds do have the ability to pick it up fast, it is important to take a few simple precautions to keep your canine companion safe. 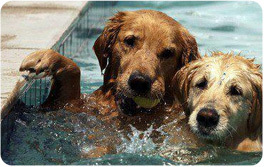 Even if your dog is an expert swimmer, investing in a good floatation device can head off trouble before it begins. Remember that some breeds such as bulldogs, can't swim at all and a lifejacket or specialized floatation device can be a life-saver. Just like kids, dogs can get very excited around water and will often be preoccupied with running leaps into the water or chasing a ball or stick. It is up to the owner to pay attention to the depth, rocks, ledges, and other potential hazards. When engaging in activities that involve deep water such as boating or sailing, keep your dog leashed to prevent unwanted jumps or accidentals tips over the edge while the boat is in motion. Before heading out on a major adventure, take the time to get your dog comfortable and confident around water. Carefully supervised test swims in calm, shallow water are a great way to improve his or her swimming skills and ease any potential fear of the water. When teaching your dog how to swim for the first time, you may have to support the belly at first until he or she gets comfortable using the front and back legs to paddle and remain stable above the water. Cats rarely will join the family for a day trip to the lake but play pools and splash areas can be dangerous to a prowling kitty. Cats will look for a drink almost anywhere in the heat of the day and can full in if startled. Be sure to keep a close eye on your cat when playing outdoors around water, especially if you have a curious kitten. Small cats are often unable to escape a pool after an accidental fall due to the height of the ledge. Always drain kiddie pools after use to prevent bacteria growth and disease carrying mosquitoes that could impact your pet. 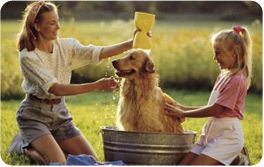 Last but not least, remember to rinse your dog with fresh clean water after a day of swimming and outdoor activity. Summer is prime time for chiggers and other unwanted parasites so you must take extra precautions to make sure that anything that may have hitched a ride from a lake or river stays there and doesn't make its way into your house. Aside from pests, other nuisances such as sand and chlorine can irritate your dog's skin and lead to itching so a full rinse really is worth the effort. Be sure to provide adequate fresh water after your day at the lake or the pool! All of that activity in the hot summer sun can quickly lead to dehydration and if your dog is busy with entertainment, he or she may not recognize the need for extra water until things start to wind down. By following these simple tips, you can be sure that your next day around water is safe and enjoyable for your entire family!